MDCares.net - Morris & Dickson Co.
An Online division of Morris & Dickson, Co. LLC. Click the Sign In link in the upper right of your browser to log into M&D CARES. Is M&D CARES Right For You? M&D CARES is ideal for Hospitals, Behavioral Health, Oncology Clinics, Health Clinics and Free Clinics. M&D CARES is a powerful program which streamlines application processes associated with patient assistance programs. M&D CARES drives efficiency and productivity by providing robust systems, tools, and software. M&D CARES simplifies the application process, minimizes manual data entry, maximizes productivity in high volume environments, and provides flexibility to meet varying needs. With over fourteen years of experience M&D CARES has developed proven efficiencies which bridge the information flow across the many affected hospital and clinic departments, significantly impacting the logistical challenges associated with patient assistance program requirements. To see if M&D CARES is right for your facility, please contact us for a money savings analysis. In efforts to assist uninsured patients with growing pharmaceutical expenses and to help control rapidly increasing medication costs, healthcare systems are looking to Pharmacy Patient Assistance Programs. M&D CARES offers a complete package of development analysis, on-site consulting, and software designed to drive the recovery process, as well as document the associated savings of medications recovered from manufacturers and provided to needy patients by your institution. Everyday more and more people are finding themselves without prescription coverage. This trend is forcing healthcare systems to look for alternative sources of revenue to offset this growing trend. M&D CARES Online helps your organization benefit the local community by assisting in the recovery of needed medications. 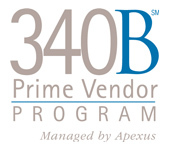 M&D CARES is a 340B PVP Preferred Service Provider. Copyright 2004 - M&D CARES. All Rights Reserved.